For people of a certain age, one iconic image screams “Florida”: A dolphin, leaping majestically into the air, to the delight of an enthusiastic crowd—cameras snap, everyone smiles. 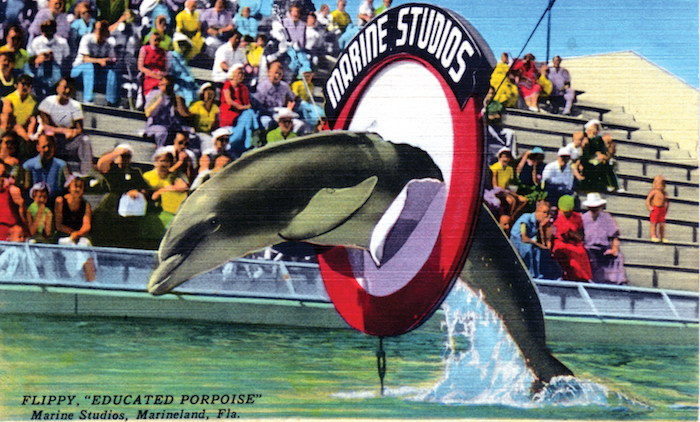 The 1950s and ’60s craze for Florida dolphin shows has left us with boatloads of appealing collectibles. Postcards, brochures, and souvenirs such as flying dolphin salt-and-pepper shakers convey a sunny nostalgia for family vacations spent on Florida’s beaches. But such imagery disguised—and still disguises—the grim reality behind these shows: Animal trainers, and tourists, were well aware of how intelligent dolphins are; that’s what makes them so fun to watch. But back then, no one stopped to consider how much a brainy animal would suffer being held in captivity and forced to do silly tricks. That’s why, like vintage circus kitsch featuring lions, tigers, and elephants, vintage dolphin-show memorabilia recalls another time when humans freely abused animals for entertainment and glossed over it with cheerful souvenirs. Humans have long singled out dolphins as unique among the animal kingdom, gentle and majestic sea creatures that had the potential to communicate their thoughts, solve puzzles, and express human-like emotions. Stories and legends about the human-dolphin connection stretch back as long as written history. The Greeks and Romans, Pacific Islanders, early Europeans, Amazon tribes, Maori, and Aboriginal Australians were all dolphin-mad, and images of dolphins were stamped onto coins, painted on walls, chiseled into statues, tattooed on ancient bodies. Did Aristotle, too, envision a dolphin that could pop out of the water to speak to us like something from a dream? Smiling out from ancient depictions of love-goddess Aphrodite, the wise-eyed Greek dolphins hint at an otherworldly consciousness humans long to connect to. Throughout history, tales abounded of dolphins’ friendliness with humans—which, frankly, hasn’t gone well for the dolphins. After European scientists discovered in the 19th century that marine life could survive in a glass aquarium, it touched off an unstoppable Victorian fad, a.k.a. “aquarium mania,” for capturing a little bit of the ocean in one’s living room. Ornate aquaria in fancy cast-iron brackets made a big splash at London’s Great Exhibition in 1851, as did the first-ever public aquarium, which opened at the London Zoo in 1853. Polite Victorians in black mobbed the zoo to get a look at the crabs, mollusks, fish, and underwater plants that had previously hidden beneath the surface of the sea, and then bought miniature versions for their tables at home. Even the Victorians who couldn’t maintain a tank in their homes could participate in this ocean fever through knickknacks and décor. Thanks to the particular mythology around dolphins, Victorians cottoned to dolphins as a decorative element, producing lamps, inkwells, candlesticks, cups, plates, and vases in glass, iron, bronze, and silver with dolphin designs. Dolphins held up the corners of building friezes, curled their tails at the end of letter openers, and glittered in brooches and stickpins. Even today, stylized dolphins are prominent on Victorian-era houses, particularly in coastal areas like San Francisco. In the latter half of the 19th century, tanks and the live animals displayed within got more and more elaborate as aquarium enthusiasts figured out, by depressingly deadly trial-and-error, what could be kept in which conditions. Early experiments in the capture and display of marine mammals went no better: A pair of beluga whales displayed at P.T. Barnum’s American Museum in New York City in 1861 lived just two days before perishing, and a total of nine whales would die, including two who were either boiled alive or grilled on a scorching-hot floor—the newspapers of the time disagree on this point—when the American Museum burned down in 1865. But dolphins were easy to catch, so we kept on catching them. New York’s American Museum of Natural History tried its luck, too, with a 1913 display of five bottlenose dolphins, but all of them died before two years had passed. 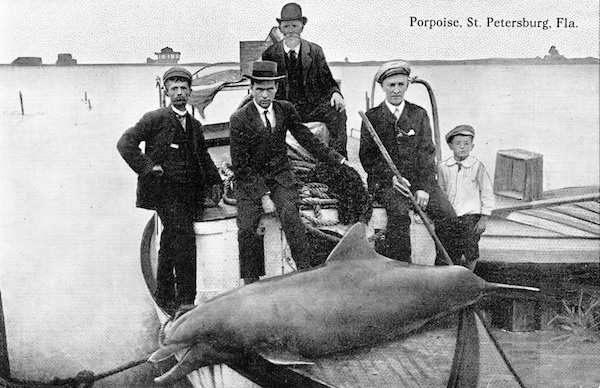 It wasn’t until 1938 that dolphins were successfully exhibited for a paying public by the consortium of moneyed marine-life enthusiasts that founded Marine Studios in St. Augustine, Florida. The place was originally envisioned as an underwater movie set, with camera-ready plants and animals living in one of two half-million-gallon steel tanks equipped with hundreds of portholes situated to give the best camera angles. Somebody got the notion to sell tickets to looky-loos to offset costs. It turned out to be a great idea: 30,000 tourists showed up on the first day, and kept on coming to see the helmeted diver sink to the bottom of the tank to feed the barracuda and tarpon, the bright captured coral reef with darting fish as unfamiliar to these pre-SCUBA Sunday drivers as the landscape of the moon. Tim Hollis, the author of Glass Bottom Boats & Mermaid Tails: Florida’s Tourist Springs, says the crush shouldn’t have come as a surprise. “The whole idea of a Florida vacation was to see things you couldn’t see anywhere else,” he points out. Strange tropical plants and mysterious creatures were as important to the early Florida tourism industry as beaches and orange groves. 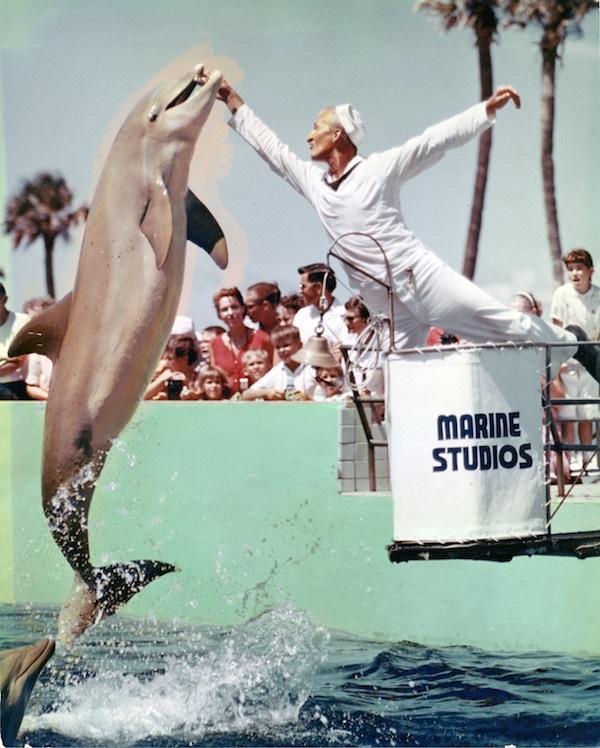 Historical accounts differ on who was really responsible for the dolphin-training craze. Some credit a Grassy Key, Florida, entrepreneur named Milton Santini with the discovery that dolphins would perform actual dog-like tricks on command. 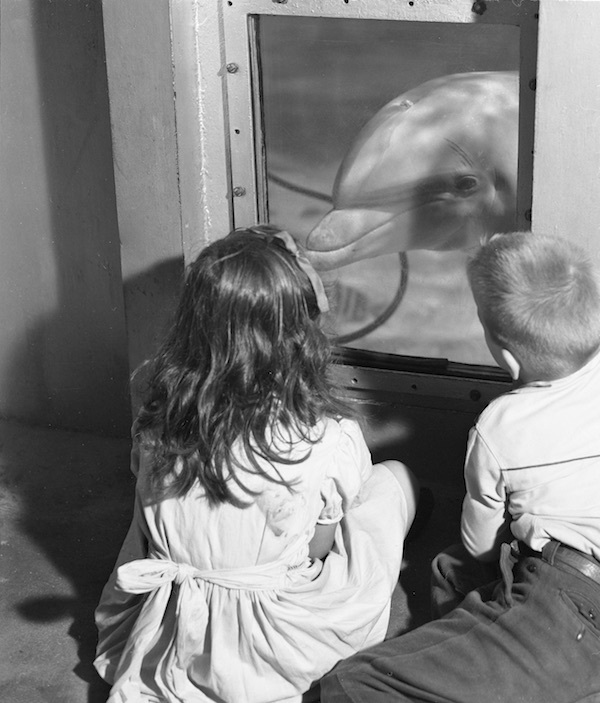 The story goes that Santini captured and displayed dolphins in his mini oceanside zoo in the early 1950s. After a terrible car accident, Santini used therapy balls as a part of his recovery. One day, when he dropped a ball in the water, an impish dolphin brought it back to him. That game of fetch was soon expanded into a whole array of coaxed stunts. Flippy was such a hot commodity he got a featured segment in “Revenge of the Creature,” the 1955 sequel to “Creature From the Black Lagoon,” and was even the subject of cultural commentary. Spurred on by the fantastic success of Marine Studios (renamed Marineland in 1961), dolphin shows and ocean attractions became a cultural phenomenon, springing up in Florida (Miami’s Seaquarium, Fort Walton Beach’s Gulfarium, Islamorada’s Theater of the Sea) and other coastal areas (the L.A.-area Marineland of the Pacific), and, as time went on, even inland tourist towns started importing dolphin attractions. SeaWorld San Diego, developed by a quartet of former frat brothers, hit the scene in 1964, the same year another dolphin-related touchstone launched: “Flipper.” Between 1964 and 1967, the movie-turned-TV-show gave the dolphin trend a major boost as kids who knew the show’s theme song by heart clamored for a look at a real-live dolphin. 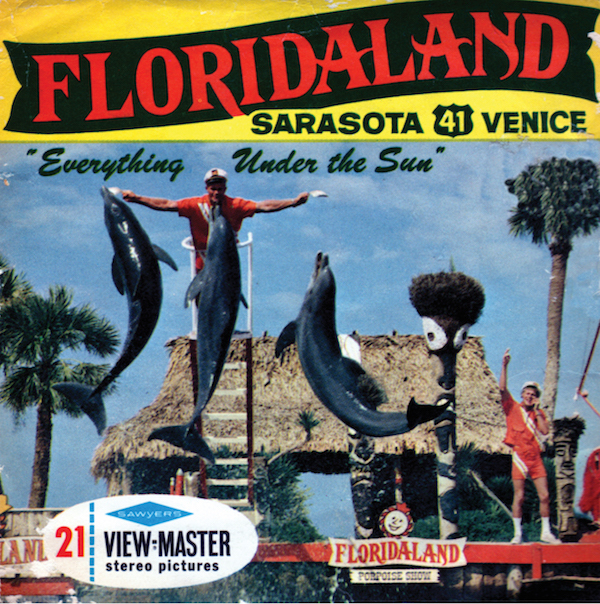 Developed by TV producer Ivan Tors, who previously created the action-adventure series “Sea Hunt,” and Florida stuntman and diver Ricou Browning (the man inside the “Creature From the Black Lagoon’s” rubber suit), the show did as much to put Florida’s friendly-faced dolphins on the tourist’s to-do list as Marineland itself. 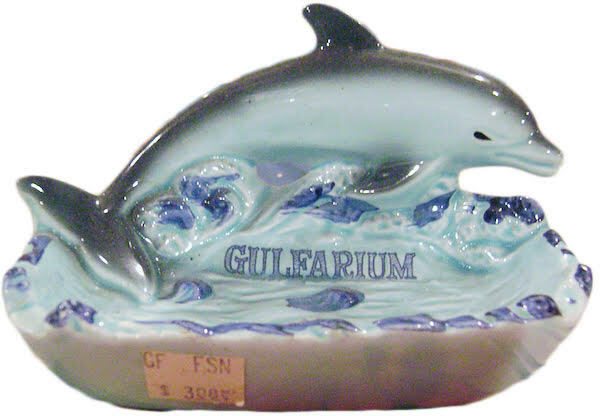 Dolphins soon appeared in a dizzying array of souvenir merchandise: keychains, felt pennants, banks, salt-and-pepper shakers, snowglobes; all were emblazoned with images of dolphins rising majestically from the water or accepting a proffered fish. 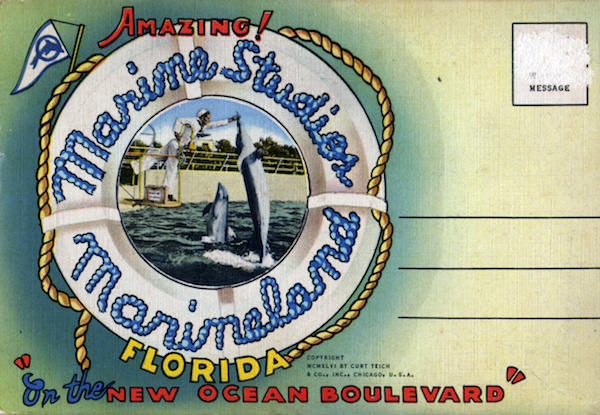 These gewgaws were even cooler if Marineland’s name appeared on the souvenir, proof that you’d visited the real McCoy in sunny Florida instead of one of the lesser knock-off parks in other towns. Mattel made a “Flipper” board game. “Flipper” fans could wear swim trunks with the show’s logo, sport a Bradley glow-in-the-dark Flipper watch, or play with a “spouting dolphin” water toy (batteries not included). This perky kid-friendly merchandise conveyed a happy image of dolphin shows that was often at odds with the dolphins’ lived experience of them. In fact, evidence was piling up that the experiences of captive marine mammals were pretty grim. Even though marine biologists continued to refine their abilities to keep dolphins alive, animal activists argued it was cruel to keep intelligent mammals in a tank, no matter what the size. Dolphins in the wild swim hundreds of miles a day and interact with an underwater world of other creatures. Dolphins in captivity often engage in repetitive behaviors, self-injure, and become aggressive to trainers or other animals. Above all, it was clear that captivity shortened dolphins’ life span: Bottlenose dolphins can live for an average of 40 years in the wild. But captive dolphins only make it an average of 5. Just capturing the dolphins was extraordinarily stressful and terrifying for the animals, to say nothing of imprisoning them, sometimes in solitary confinement, in bare tanks only large enough to swim circles in. Training them and displaying them posed additional dangers. Richard “Ric” O’Barry, who trained the five dolphins who appeared as “Flipper” on TV, was abruptly transformed into an activist in 1970 when one of the “Flipper” dolphins sank to the bottom of her tank—and never came back up. Convinced that the death was a suicide, O’Barry has spent the subsequent five decades working to dismantle the captive-dolphin industry, throwing his muscle behind the slowly burgeoning dolphin-protection movement. The watershed Marine Mammal Protection Act, which made it illegal to “collect” wild marine mammals without a permit and to import marine mammals into the United States, was passed in 1972. 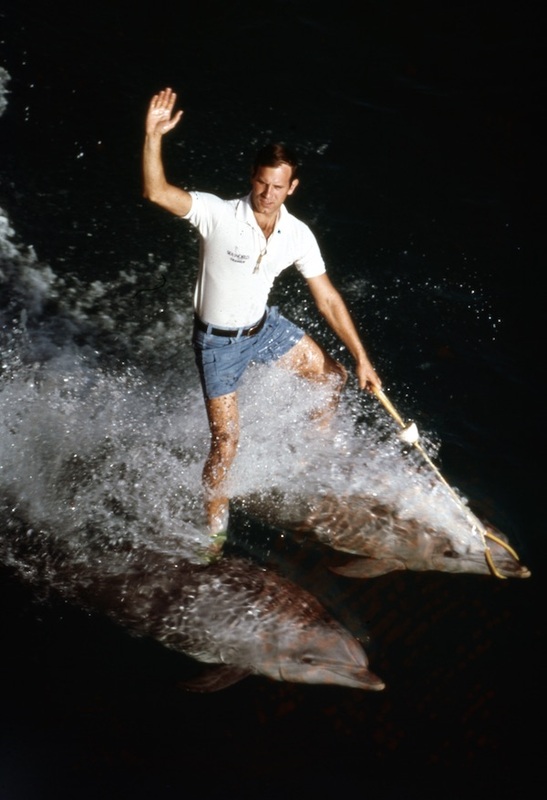 And by the late 1980s, dolphin shows were starting to look not just old-fashioned, but cruel. Tourists found it increasingly hard to enjoy the antics of creatures they knew to be intelligent. Particularly as travelers strayed further and further off the beaten path—away from major parks like Marineland and SeaWorld—they found roadside attractions with dolphins kept in conditions that were progressively more inhumane. As research on the terrible toll captivity takes on marine mammals piled up, the crowds ringing the watery amphitheaters died down. 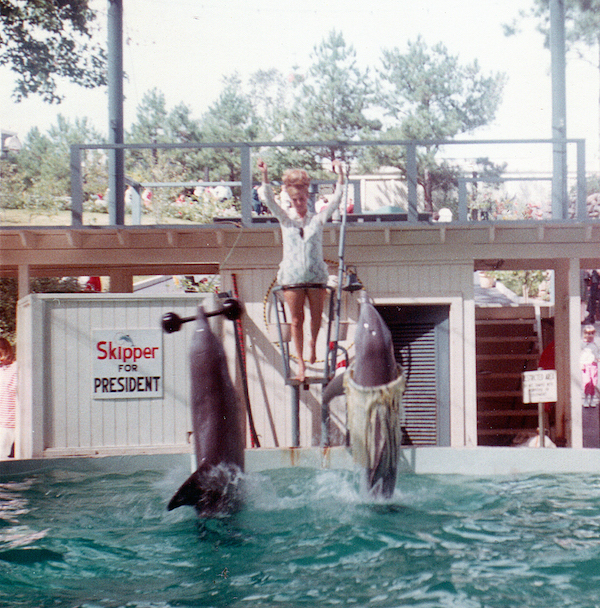 Both Marineland and SeaWorld tried to set themselves apart by veering more toward education than entertainment in the 1980s and 1990s, and by trumpeting their state-of the-art facilities, particularly on SeaWorld’s part—which had by then opened SeaWorld Orlando in Florida (1973) and SeaWorld San Antonio in Texas (1988) in addition to the original SeaWorld San Diego. Despite their efforts, the parks were clearly slipping in cultural relevance, though the 1993 movie “Free Willy,” ironically, made SeaWorld’s captive killer whales a must-see for family audiences for a time. But by the time dolphin-hunting expose documentary “The Cove” galvanized dolphin activism in 2009, most Americans considered marine mammal shows to be akin to performing circus animals: unnatural, cruel, and inhumane. In 2010, Malcolm Brenner published his autobiographical novel, Wet Goddess, a truth-is-stranger-than-fiction account describing a man’s sexual affair with a female dolphin. 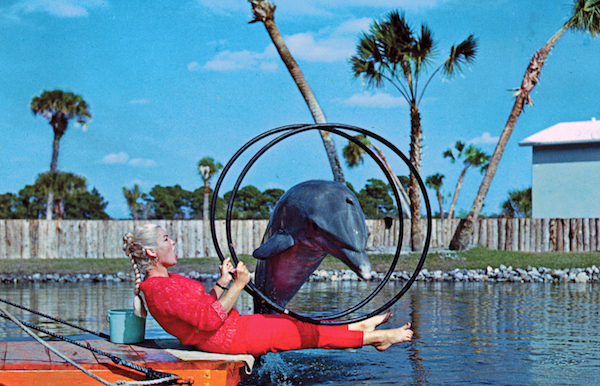 In interviews about the novel, Brenner claims he was seduced by a dolphin named Dolly who performed at a Sarasota amusement park called Floridaland, in 1970. Even though he told the Huffington Post, “I wrote this book for dolphins because we are mistreating these animals by keeping them in captivity,” his story certainly didn’t help erase the sordid sideshow vibe of these attractions. Although our public consciousness on trained captive marine mammals has shifted, souvenirs with dolphin imagery, or associated with Marineland and other vintage sea-creature theme parks remain highly collectible. Ken Breslauer, author of Florida Roadside Attractions History: The Complete Guide to Florida Tourist Attractions Before Disney points out that collectors tend to collect by attraction, and it’s “important for them to remember the history, good and bad.” He notes racist black Americana—including artifacts from Florida’s most offensive vintage attraction, Lewis Plantation, which operated as a faux Deep South plantation, complete with black actors portraying slaves—is often collected for similar reasons, to remember the uglier side of American pop culture. Much like collectible circus animals, dolphin collectibles occupy a strange place in our consciousness. We know that this memorabilia comes from a time and place in which its subjects were mistreated, but collectors can look at them with historical distance. Our attitudes toward animal welfare have shifted, and these souvenirs capture a moment in time that won’t exist in the same way again. “ ” Napier made jewelry that fits any kind of mood that you could want to convey in your outfit.